Dental Implants Seattle: When Should I Try To Save My Natural Teeth? When discussions come up about dental implants, one of the first questions to be presented is, “should I try to save my natural teeth before committing to dental implants?” Although it would be nice to give a definitive answer to this question, it’s highly dependent on the condition of the patient, their oral health history, and ultimately, their choice. 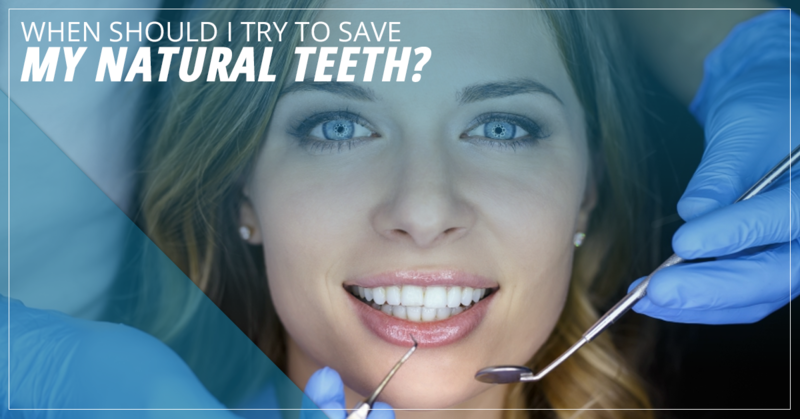 In this blog, we’re going to take a look at all the factors that go into determining whether you should have a natural tooth replaced or preserved. If you have any questions, be sure to contact Same Day Implants. Periodontal disease is a serious medical condition that far too many Americans are faced with, especially in old age. What makes periodontal disease such a concern is that it damages the supporting structures of the teeth, so once it reaches an advanced stage, tooth loss is almost inevitable. However, just because someone has periodontal disease, doesn’t mean they need to get their tooth extracted and replaced with a dental implant. If your teeth and gums are showing early signs of periodontal disease, your periodontist will do everything possible to preserve the tooth before resorting to extraction. One process used to deep clean the teeth is called root scaling and planning that helps to clean below the gum line. This also helps restore your gums and prevent periodontal pockets which allow bacteria to reach the roots of your teeth. Whereas periodontal disease damages the gums and other periodontal functions that support the teeth, tooth decay is what damages the teeth themselves. When food containing carbohydrates stick to the teeth and aren’t removed with brushing or flossing, tooth decay will begin. Although tooth decay can sometimes be reversed, similar to periodontal disease if it progresses far enough into the tooth, the tooth will need to be extracted. If you’ve ever sustained an injury to your natural teeth, you may be wondering whether you need to have it replaced or not. The answer to this question will depend on the severity of the injury. For example, if there is a verticle crack in your tooth that extends below the gum line or is entirely split, you will most likely need an extraction. However, teeth with craze lines, fractured cups, or chips typically don’t need to be removed. Ultimately, if you’re experiencing one of the conditions above, your best bet is to speak with a certified periodontist who will be able to perform a comprehensive exam and diagnosis. If the damage is bad enough your periodontist may recommend having the tooth extracted and replaced with a dental implant. However, if the issue has not progressed too far, you may still have an opportunity to save it. It’s important to contact an experienced periodontist who will give you reliable answers about your oral health. If you have any questions about this process, don’t hesitate to contact Same Day Implants in Tukwila.